HIGHLIGHTS P1 Feedback from the Final Conference in Bordeaux, January 2017 adapted from Patrick Biard’s (RAEE) presentation. Summary of project outcomes. P2-3 Panel discussion from Final Conference; time for action is now! P4 Data4Action SEAP Guidebook published and available online and in hardcopy from partners. 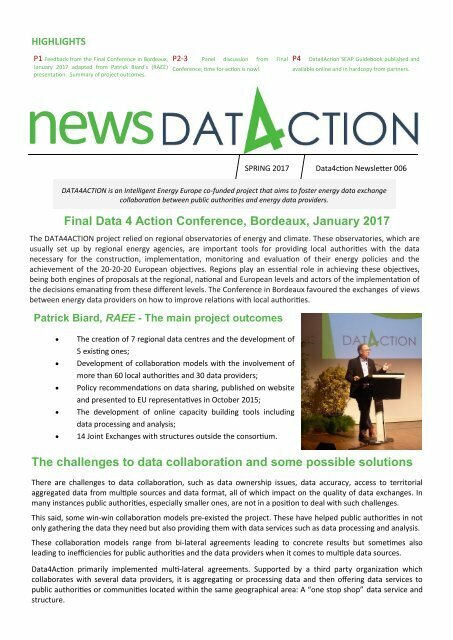 news SPRING 2017 Data4ction Newsletter 006 DATA4ACTION is an Intelligent Energy Europe co-funded project that aims to foster energy data exchange collaboration between public authorities and energy data providers. Final Data 4 Action Conference, Bordeaux, January 2017 The DATA4ACTION project relied on regional observatories of energy and climate. These observatories, which are usually set up by regional energy agencies, are important tools for providing local authorities with the data necessary for the construction, implementation, monitoring and evaluation of their energy policies and the achievement of the 20-20-20 European objectives. Regions play an essential role in achieving these objectives, being both engines of proposals at the regional, national and European levels and actors of the implementation of the decisions emanating from these different levels. The Conference in Bordeaux favoured the exchanges of views between energy data providers on how to improve relations with local authorities. Patrick Biard, RAEE - The main project outcomes The creation of 7 regional data centres and the development of 5 existing ones; Development of collaboration models with the involvement of more than 60 local authorities and 30 data providers; Policy recommendations on data sharing, published on website and presented to EU representatives in October 2015; The development of online capacity building tools including data processing and analysis; 14 Joint Exchanges with structures outside the consortium. The challenges to data collaboration and some possible solutions There are challenges to data collaboration, such as data ownership issues, data accuracy, access to territorial aggregated data from multiple sources and data format, all of which impact on the quality of data exchanges. In many instances public authorities, especially smaller ones, are not in a position to deal with such challenges. This said, some win-win collaboration models pre-existed the project. These have helped public authorities in not only gathering the data they need but also providing them with data services such as data processing and analysis. These collaboration models range from bi-lateral agreements leading to concrete results but sometimes also leading to inefficiencies for public authorities and the data providers when it comes to multiple data sources. Data4Action primarily implemented multi-lateral agreements.  Supported by a third party organization which collaborates with several data providers, it is aggregating or processing data and then offering data services to public authorities or communities located within the same geographical area: A “one stop shop” data service and structure.